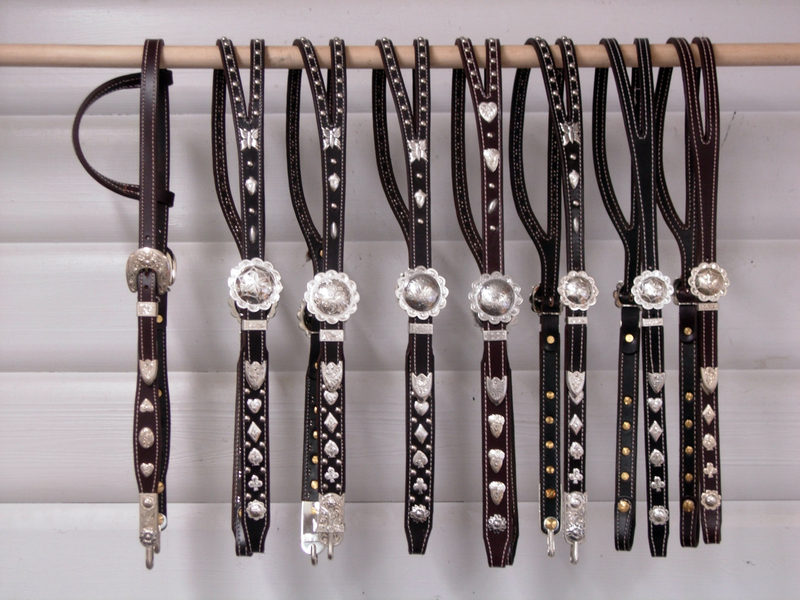 Buckaroo Jewelry comes in different forms, but cowboys out West like to show the pride in the lifestyle they choose and the respect for the horses they ride with nice headgear. 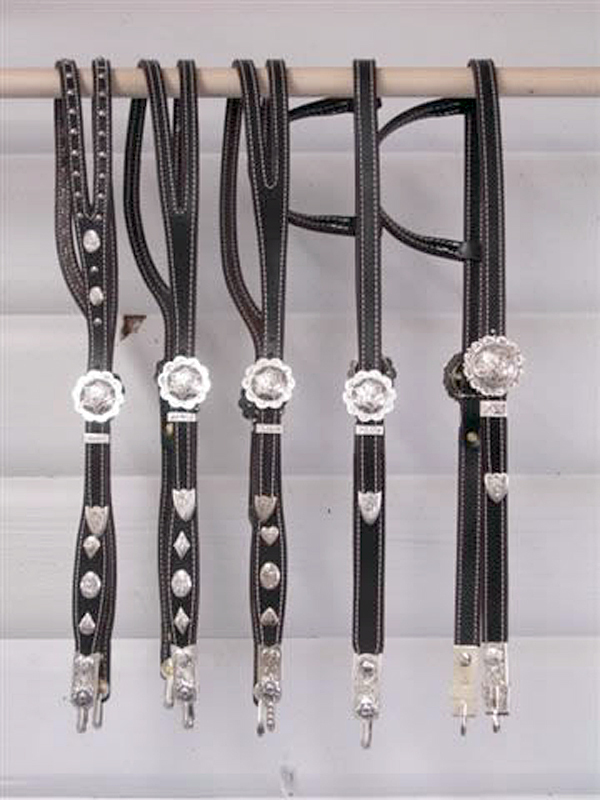 In the Headstall Gallery you will find some of the headstalls we have made for our customers; split ears, brow band headstalls, concho buckles, or regular buckle sets. We can accommodate just about every wish! Click on photo to enlarge, prices below. #1 $570, #2 $585, #3 $825, #4 $575, #6 $630, #7 $420, #8 $420. 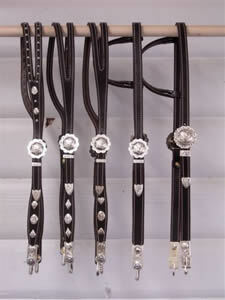 Most of the big saddle shops on the West coast have turned out a version of this headstall in the early 1900s with a few variations, they featured a fairly wide cheek (7/8 to 1" width) with heavy silver ornamentation, big concho buckle (from 1 3/4 to 2 1/2" diameter) and spots on the cheeks and crown. 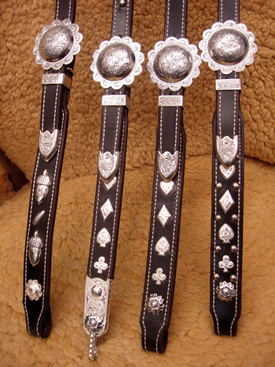 Some designs had a heavy center bar buckle instead of the concho. 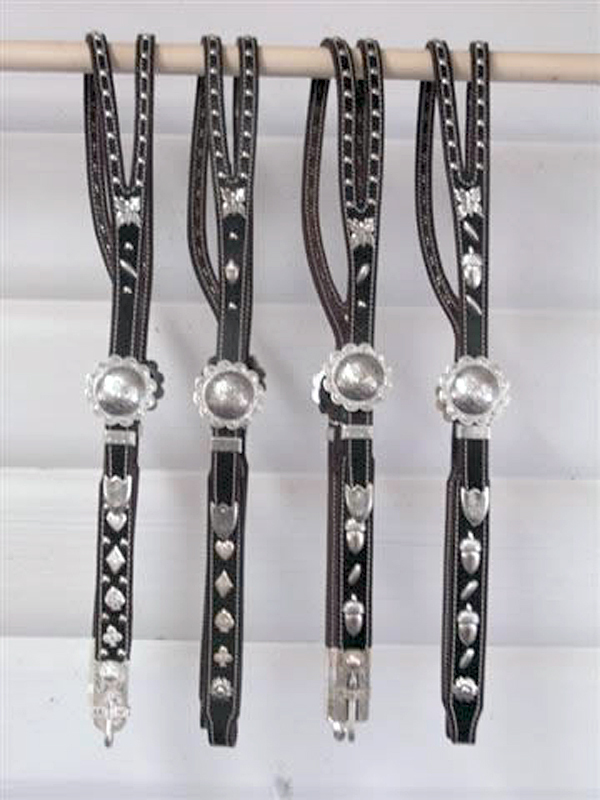 The most popular cheek design had card suit ornaments, but they also came with acorns, conchos, or whatever the silversmith could come up with to dress them up. 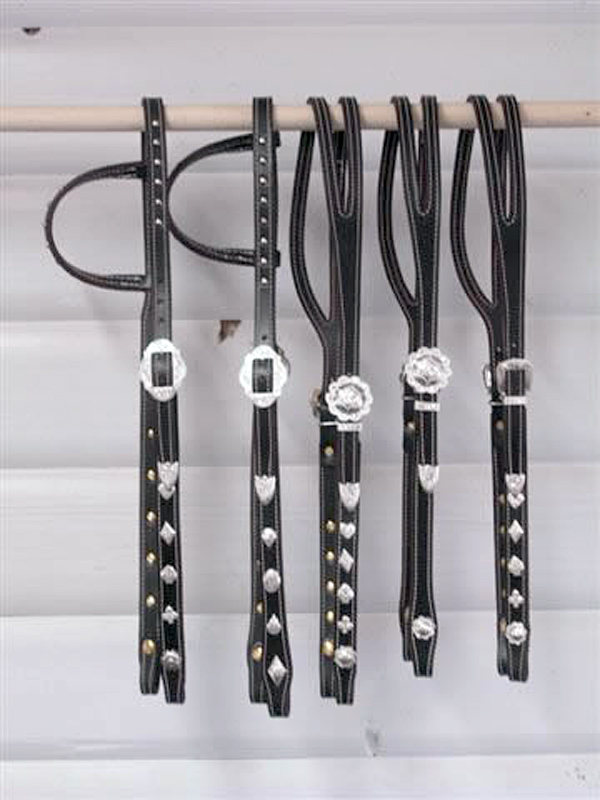 Quite often they also had snake head bit hangers to connect the bridle to the headstall. 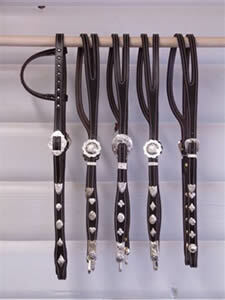 The pictures shown in this section present some of the headstalls we have made for our customers. 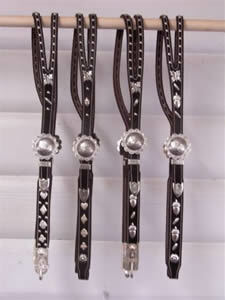 These headstalls will have to be sized accurately because the heavy silver ornamentation restricts the range of adjustment. The designs will be customized to your specifications! 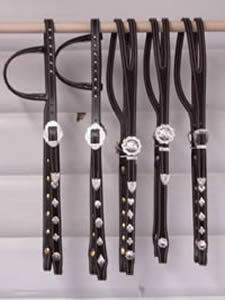 To make sure of a good fit, we'll need a headstall length from bit end to bit end. 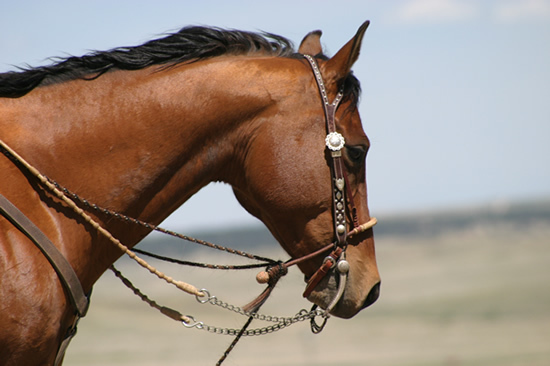 To obtain that measurement, adjust any headstall on your horse with the bit you want to use and with out changing the buckle adjustment take it off the bit and tie the cheeks back at the bit ends. Stretch it tight on a table and note that measurement. 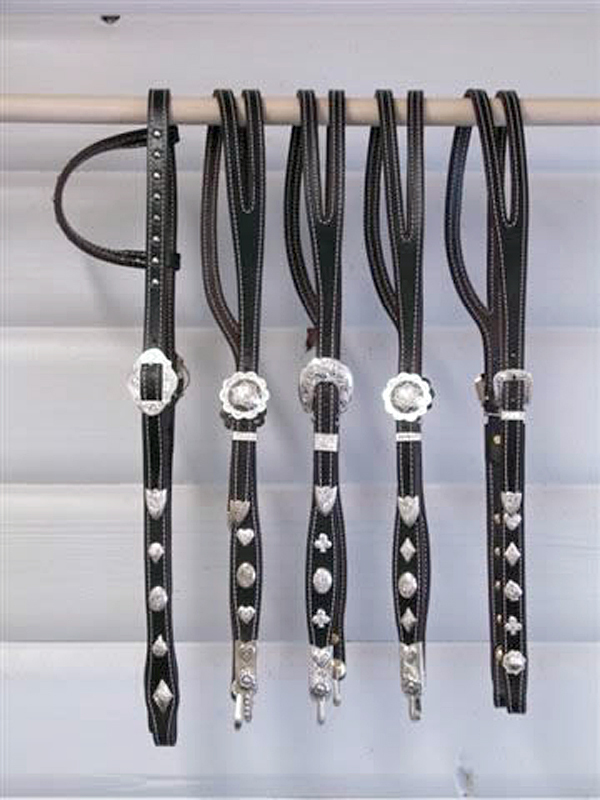 - A sliding ear headstall will let you adjust the ear piece better and allow for the buckle to be set higher on the cheek. 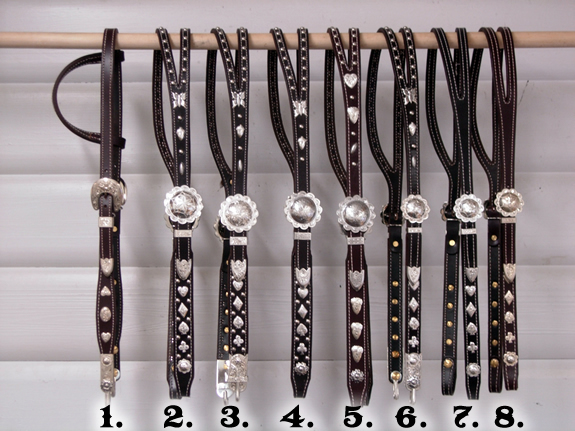 - Lighter cow-horse type 38"
- Smaller ranch horse 39"
- Regular ranch horse 40"
- Heavy rope horse 41"
- Desert Horse and Thoroughbred 42"
All the headstalls are available in a very dark brown (near black) leather or a rich dark chestnut with your choice of bridle buckles and ornaments. "The nicest thing I gave her since I gave her the ring." - Bill C.